Sony has confirmed rumours of a PS2 redesign and said that the lighter, third-generation model will be released in Japan later this month. The new model is almost exactly the same size as the current model - it's a mere 1mm shorter - but it weighs a lot less: 720g to the current model's 850g. As expected, Sony has integrated the AC power brick into the new version and will offer gamers a remodelled stand too, although it’ll be sold separately. 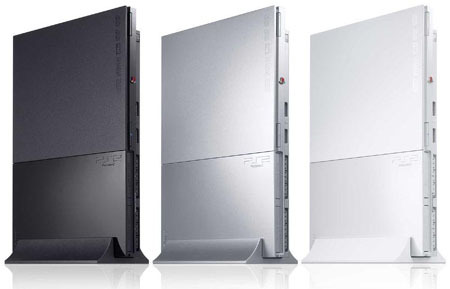 The launch is undoubtedly timed to help the company achieve its ambitious forecast of selling a further 12m PS2s by March 2008. But there's no price cut - at least not yet. Japan will take first delivery of the new model – dubbed the SCPH-9000 – on 22 November, in a choice of either charcoal black, ceramic white or satin silver colours for around ¥16,000 (£67/€90/$130). That's what Sony charges for the current PS2. The new model will be coming to Europe in 2008, Sony told games trade site GamesIndustry.biz.